Home News JAS YouthBuild wins an award at The Furniture Trust's Eco-Carpentry Challenge! JAS YouthBuild wins an award at The Furniture Trust’s Eco-Carpentry Challenge! On Thursday, May 4, JAS’s YouthBuild students won the Best in Class, Small Shop award at the 7th Annual Eco-Carpentry Challenge, sponsored by The Furniture Trust! The Eco-Carpentry Challenge showcases projects designed and built by local high school students using recycled furniture. The goal of the annual Challenge is to educate students and teachers about the value of recycling, while providing a creative opportunity for students to demonstrate their carpentry skills transforming old furniture into new products. 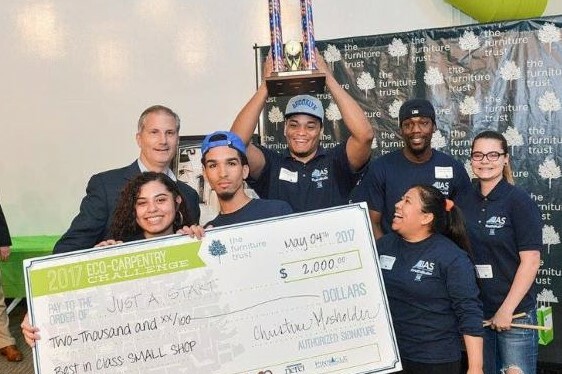 After months of hard work, JAS YouthBuild students built an impressive drum set and robot out of old furniture, and won the Best in Class, Small Shop award as well as $2,000 prize money. Congratulations!